Our itinerary shall take us through the streets of the old city centre of Rome on a journey of discovery dedicated to the masterpieces of a great artist – Michelangelo Merisi, also known as Caravaggio. The itinerary starts at the Galleria Borghese which boasts the world’s largest collection of Caravaggio’s works. Here, visitors can admire as many as six canvases by this artist (a man renowned for his stormy life). The canvases are the Boy with a Basket of Fruit (1593-1594), the Young Sick Bacchus (1593-1594 ) – works from Caravaggio’s youth, belonging to the sequestered collection of the Cavalier d’Arpino –, the Madonna and Child with St Anne (dei Palafrenieri) (1605-1606) – commissioned by the Arch-confraternity of the Papal Grooms for their altar at St Peter’s (the commissioners rejected the work, which was then acquired by the nephew of Paul V Borghese) –, David with the Head of Goliath (1605-1606) – painted during the artist’s second stay in Naples, probably in order to curry favour with Cardinal Scipione Borghese in the hopes of a return to Rome –, Saint Jerome Writing (1605–1606) – painted specifically for Cardinal Scipione Borghese in gratitude (since the cardinal had aided him following troubles with the law) –, and, lastly, the Portrait of Pope Paul Paolo V (1605-1606). Our itinerary then takes us to the Casino Ludovisi and the chamber hosting the alchemical laboratory. In the small vault, Caravaggio painted in oils on the walls the deities, Jupiter, Neptune and Pluto, the children of Chronos, lord of the Universe. Let us now move on to the Galleria Nazionale d’Arte Antica, Palazzo Barberini. 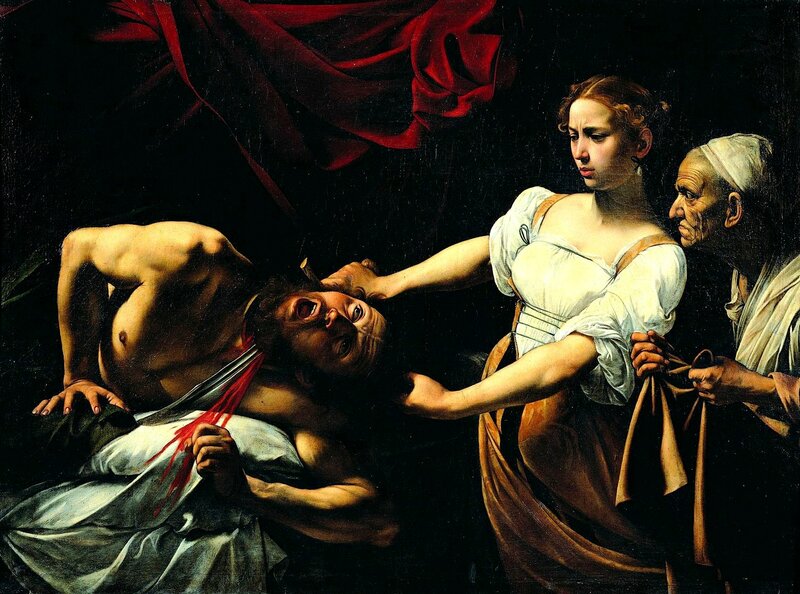 Here, we find the Judith Beheading Holofernes, which may be identified with the Judith portrayed by Caravaggio for the banker, Ottaviano Costa, and the Narcissus, which was attributed to Caravaggio despite some opposition (after restoration, the work has been definitively attributed to Caravaggio). The next stop on our journey is the Galleria Doria Pamphilj. Here, we find the work, The Rest on the Flight into Egypt, which may be seen as a painting which most clearly reflects the period of Caravaggio’s training and formation as an artist. The gallery also hosts a Mary Magdalene. In the Pinacoteca Capitolina we find The Fortune Teller, painted for Cardinal Del Monte (which may be dated back to 1594) and Saint John the Baptist, a painting the existence of which had been practically overlooked until, to the great surprise of all, it was discovered in the office of the Mayor in 1953. This is probably the painting ordered in 1602 by the nobleman, Ciriaco Mattei, who commissioned it from Caravaggio in view of the name of his eldest son, Giovanni Battista (who inherited the canvas). A work by Caravaggio painted between 1602 and 1604 – The Entombment of Christ – is also to be found at the majestic Musei Vaticani. Our itinerary also includes churches. Our first visit is to the Church of San Luigi dei Francesi. 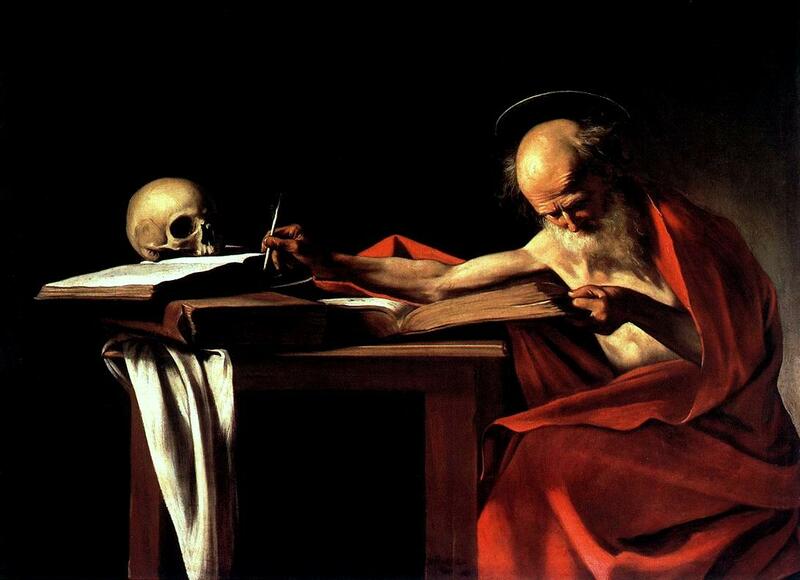 Between 1599 and 1600, Caravaggio painted the works of the Contarelli chapel, The Calling of Saint Matthew and The Martyrdom of Saint Matthew. Here, we note Caravaggio’s original approach to an artistic trend of the period of the Counter-Reformation, namely the practice of commemorating Martyr Saints, popular at that time. In the Church of San Luigi dei Francesi we also find the second version of the altarpiece, The Inspiration of Saint Matthew. The first version had been rejected as unsatisfactory. Our itinerary then leads us from San Luigi dei Francesi to the Church of Sant’Agostino. Here, on the altar of the first chapel to the left (the chapel of the House of Cavalletti), we find the Madonna of Loreto. 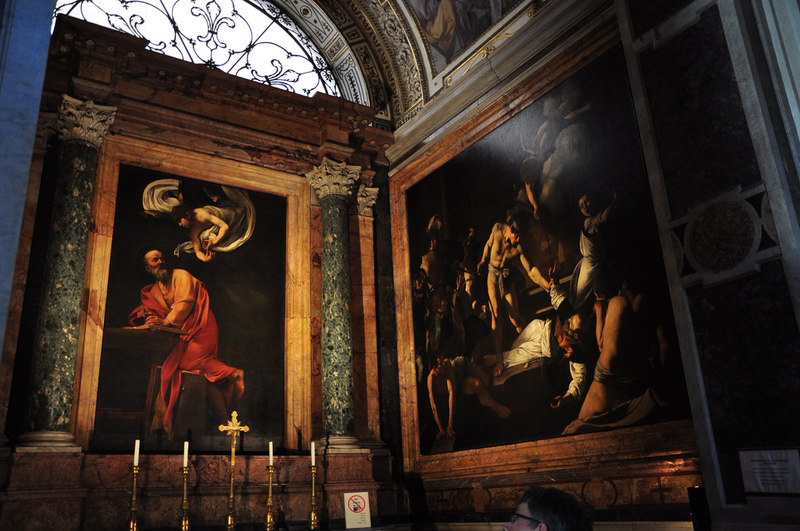 Our journey around the churches of Rome which boast works by Caravaggio takes us at last to yet another ‘unmissable’ location – the Church of Santa Maria del Popolo. To the left of the main altar is the chapel known as the cappella Cerasi. Next to the central altarpiece (by Annibale Carracci), we find two celebrated works by Caravaggio, The Conversion on the Way to Damascus and The Crucifixion of Saint Peter.